Hey boo! Halloween is nearly here, and we’re feeling pretty prepared. From awesome group Halloween costumes to Disney princess costume inspo, we’ve got you covered in the dress-up department. While costumes are great, it’s fun to create epic looks with makeup on Halloween too — which is exactly what popular YouTuber Brianna Fox did this year. Her seriously fab glam mermaid Halloween makeup look blends ghoulish with gorgeous. Take a peek at the step-by-step tutorial below and watch her in-depth video to learn exactly how to recreate this look. Step 1: Fill in your brows with a deep purple shadow like Make Up For Ever Artist Shadow Eyeshadow and Powder Blush ($21) in M928 Eggplant. Step 2: Apply a light purple eyeshadow like Makeup Geek Eyeshadow ($6) in Wisteria to the eyes, blending it up to the creases, and down your nose. Step 3: Highlight the high points of the eyes (the lid) and face (your cheekbones, bridge of the nose and chin) with Milk Makeup Holographic Stick ($28) in Supernova. Step 4: Intensify the eyes with eyeshadows that are dark and metallic, like Make Up For Ever Artist Shadow Eyeshadow and Powder Blush ($21) in M928 Eggplant, Makeup Geek Eyeshadow ($6) in Boo Berry, Makeup Geek Eyeshadow ($6) in Mermaid and Anastasia Beverly Hills Glow Kit ($40) in Moonchild. 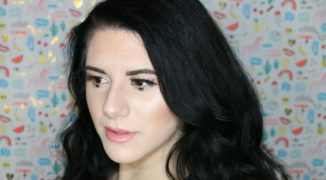 Step 5: Contour and highlight the face using unconventional contour products: eyeshadow and highlighter! Turn to Makeup Geek Eyeshadow ($6) in Wisteria, Make Up For Ever Artist Shadow Eyeshadow and Powder Blush ($21) in M928 Eggplant and Anastasia Beverly Hills Glow Kit ($40) in Moonchild. Step 6: Add a dramatic winged eyeliner using MAC Pro Longwear Fluidline ($17) in Waveline, a slightly shimmery navy blue shade. Step 7: Apply the same steps you used on your eyelids to your lower lash line for a dreamy effect using Makeup Geek Eyeshadow ($6) in Wisteria, Make Up For Ever Artist Shadow Eyeshadow and Powder Blush ($21) in M928 Eggplant and Anastasia Beverly Hills Glow Kit ($40) in Moonchild. Step 8: Add glitter to the bottom lash line. Prep the area by applying NYX Glitter Primer ($6) to ensure the sparkles won’t budge and smudge. Then apply Glitter Injections ($9) in Pure Goddess with a flat brush. Top it all off with a pair of falsies like Velour Silk Lashes ($23) in Full of It. Step 9: Apply a shimmery pink lipstick like Jouer Hydrating Lipstick ($24) in Kate as a base. Pat on Makeup Geek Eyeshadow ($6) in Boo Berry and Makeup Geek Eyeshadow ($6) in Mermaid on top to add dimension. Step 10: Highlight and contour the neck and chest using Kryolan Professional Make-Up Body Make-Up Powder Iridescent ($14) in Aubergine G, Make Up For Ever Artist Shadow Eyeshadow and Powder Blush ($21) in M928 Eggplant and Anastasia Beverly Hills Glow Kit ($40) in Moonchild. Step 11: Create gills on the arms (you are a mermaid, after all!) using Cinema Secrets Liquid Latex ($4+) and a cotton ball — you’ll def want to check out the video tutorial for this portion of the look. Pat on a sheer wash of Too Faced Born This Way Foundation ($39) to make those gills blend right into your skin. Top off the gills with NYX Cosmetics Studio Finishing Powder Translucent Finish ($10) to make everything stay in place. Add definition to the gills by applying Make Up For Ever Artist Shadow Eyeshadow and Powder Blush ($21) in M928 Eggplant underneath each gill for shape. Step 12: Finally, add the finishing touches to your glamorous mermaid look by adding rhinestones from a craft store, like Michael’s Darice Rhinestone Stickers ($2), on your upper cheekbones. And there you have it! You are officially an epic mermaid, just in time for Halloween! Follow us on Pinterest for more Halloween makeup inspo.